Velcro® brand Stick ‘n’ Sew is perfect for any application where you need to stick something soft onto something hard. Stick ‘n’ Sew is a combination pack of sticky back hook and loops that provide a convenient, versatile fastening system that’s easy enough to use in the workshop, home office, work place, garden, car or even the boat. It’s the simplest and easiest way to stick something soft onto something hard. Great for use on pelmets, bookcases, open faced cupboards and shelves, it’s perfect for closure applications using fabrics and hard surfaces. How you use Stick ‘n’ Sew is only limited to your imagination and once you use Stick ‘n’ Sew around your place, you’ll keep thinking up new ways to renovate and repair with this very clever product. STEP 1: Measure your window and cut all materials to length. STEP 2: Attach ruffle tape to curtain fabric but do not yet ruffle fabric. STEP 3: Assemble wooden pelmet box using glue and or nails. Once dry, attach (Hook) Stick on side to pelmet approx 10mm from top commencing at side working across front and then final side applying pressure to enable bond and allow to cure. STEP 4: Attach (Loop) Sew On to Hemming tape by sewing method. STEP 5: Pull hemming tape ends to ruffle fabric, giving pleated appearance. STEP 6: Simply press Ruffle against Hook tape on the pelmet and there you have a removable, washable, valance for window frame. Stick ‘n’ Sew makes installing an insect screen just as quick and easy. Once again, the Stick On tape goes onto the wood, the Sew On tape attaches to the screen. Push them together and all the nasty bugs will stay outside. 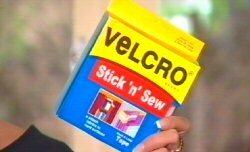 You’ll find Velcro® brand Stick ‘n’ Sew at Bunnings, Mitre 10, Kmart, Big W and all good retailers.